Richard Sellmer Verlag crafted this reproduction of one of their most popular 1952 advent calendars. Made in Stuttgart, Germany, this antique style advent calendar harkens back to traditional German values and simpler times. Measuring an impressive 27” this panorama style advent calendar is a great way to celebrate Weihnachten. 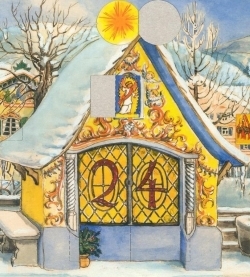 This German advent calendar features 24 doors, each with a small illustration behind it. Children will delight as they count down the days to Christmas. The vintage illustration depicts an idyllic Bavarian village lying at the foothills of the Alps. A vibrant ski chalet sits in the center of town, while children build snowmen and play. A man travels by cross country ski while another leads his livestock over a bridge. A traditional German Christkindlmarkt (Christmas Market) sits to the left of the ski chalet. The reproduction of the vintage 1952 design has remained true to traditional illustrations. Buy a vintage German advent calendar from GermanSteins.com today.